If you are struggling to communicate to multiple devices via the Ethernet port of the FX5 please click the link below for your technical tip. One of the great features of the iQ-F range is that we can update the CPU’s firmware, giving customers the ability to take advantage of new features and performance enhancements even on existing installations. The latest version is 1.060 and is available for download from the MyMitsubishi site. Installation is simple and is executed using a standard SD memory card. The best place to check how to update the iQ-F is in the e-manual (just search for “firmware update function” in the iQ-F FX5 User’s Manual (application)). The attached document contains more details plus additional information about the new FX5 analogue modules that were recently added to the range. The Mitsubishi iQ-F range continues to expand and they are now at a stage where they have a comprehensive range of hardware products for this PLC family. There is now a complete range of DC-powered CPUs available from 32 to 80 I/O. Mitsubishi now also have PT100 and Thermocouple ADP modules (attach to left hand side of CPU). As well as new digital I/O modules there will also be an FX5-80SSC-S (an 8 axis version of the existing popular 4 axis FX5-40SSC-S). All the new line up is in stock except for the FX5-80SSC-S which will be available from February. 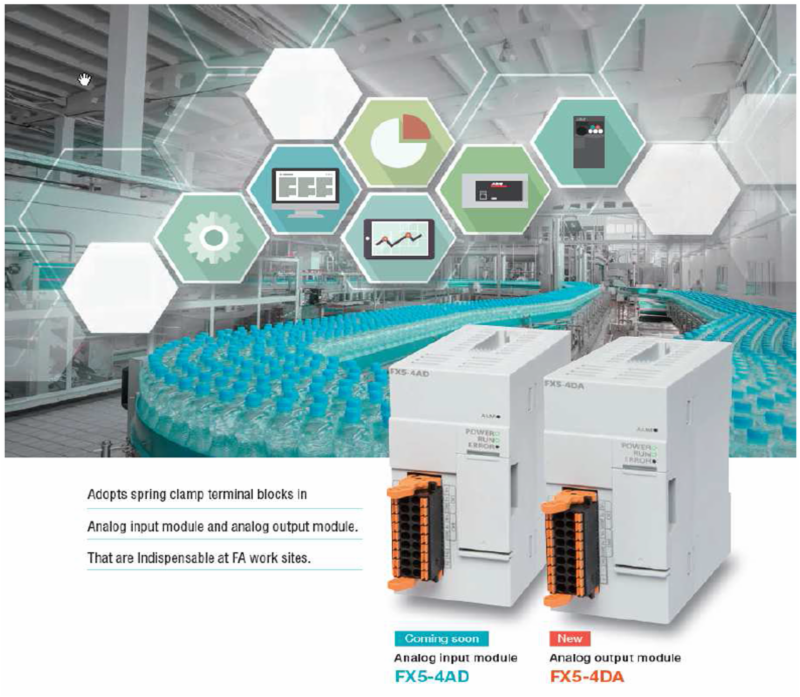 With the launch of the FX5U Compact PLC, as a part of the IQ-F Series, Mitsubishi has made this best selling PLC even better. 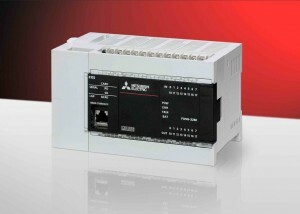 Mitsubishi launched the original FX over 30 years ago and being the first compact PLC to be seen in the European market., the FX transformed automation by bringing PLC control and functionality into smaller, lower cost applications that would previously have had to rely solely on discrete relay based logic. Each generation of the Mitsubishi FX has set new standards and now with the introduction of the FX5U, Mitsubishi has given these compact controllers a huge performance boost by focusing on processing power, expansion, built in functionality and positioning and motion functions. The Mitsubishi FX5U gives the FX a performance boost and adds new features that set benchmark standards for compact PLCs. Users are able to develop more complex and sophisticated automation systems, as well as higher performance applications without having to go for larger, more costly PLC families. Programming through the same GX Works software used for other controllers in the Mitsubishi Electric range supports scalability. HIGH SPEED INPUT & OUTPUTS – Users can achieve high speed, precise positioning at low cost with embedded multi-speed, interrupt positioning and simultaneous start. ANALOGUE & PID – With 2 analogue inputs & 1 analogue output as standard, also with improved PID performance, users have a low cost means of implementing sophisticated functions at low cost and without the need for additional hardware. IMPROVED CONNECTIVITY – The FX5U offers simple connection options to a wide range of Mitsubishi Servos, Inverters Cognex Vision Systems, Networks & Energy Meters, thus having reduced wiring effort and no additional programming. BUILT IN ETHERNET – Having Ethernet communications as standard, users can easily set up communications with other Ethernet enabled systems and perform remote data monitoring over the internet. They can also use the SNTP function (time synchronisation from a time server via a network). POSITIONING CONTROL – Mitsubishi Electric’s simple motion unit as an intelligent function module is included with the FX5U. This provides the ability to perform sophisticated motion control for up to 4 axes. Functions include linear interpolation, circular interpolation, positioning control, synchronised control. encoder following and electric cam. ADVANCED SYNCHRONOUS CONTROL – Software based synchronous control can be used as an alternative to mechanical control, such as gear, transmission, shaft and cam. Also cam control is easier with cam auto-generation. Synchronous control can be simply operated for each axis (stop/start), allowing synchronous and positional control axes within the same program. CAM AUTO-GENERATION – Simply by registering the sheet length, synchronisation width, rotary cutter axis dimensions etc, cam data for a rotary cutter can be generated automatically. All servo axes can be synchronised via SSCNETIII/H by plug & play. MARK DETECTION – The actual position of the servo motor can be obtained based on the registration mark printed on the high speed moving film. Compensation of the cutter axis position, based on the registration marks, keeps the constant cutting position. SIMPLE TROUBLESHOOTING – The FX5U offers a range of trouble shooting functions to speed system set up, increase system availability and reduce maintenance requirements. Included is comprehensive debugging functions along with diagnostics function. Simple maintenance is facilitated through improved diagnostics including error history, hardware monitor, SD card for logging & tracing functions, automatic systems recognition and several program debugging functions. SECURITY FUNCTIONS – FX5U comes with several security functions like privilege based program on SD card with copy protection password. BACKWARD COMPATIBILITY – Reuse existing FX3 expansion modules with the FX5U via a bus conversion module and easily port existing FX3 programs to FX5U.